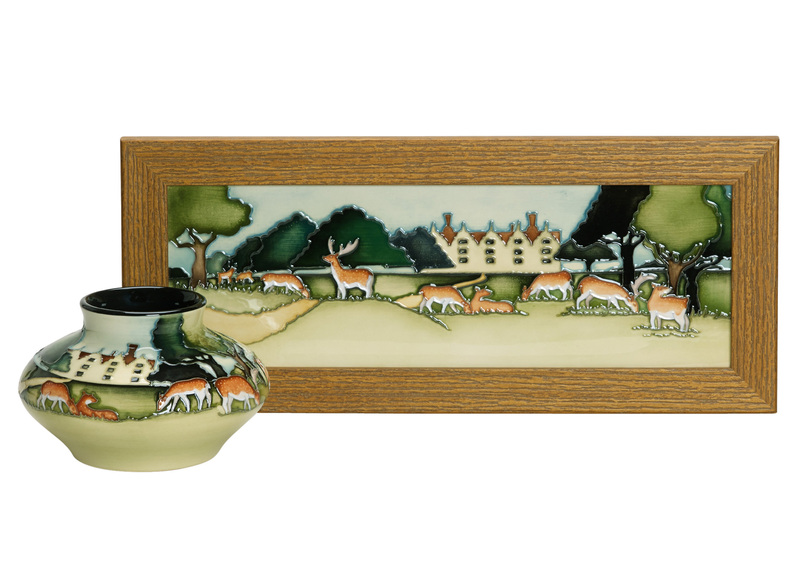 From time to time Moorcroft will creates exclusive designs that are only available from specific retailers. Below are some of our most recent collaborations. The Cotswolds, set in the heart of England, is famous for its honey-coloured stone architecture and quaint village scenes. Nestled within this historic idyll, sits one of the prettiest villages in England, Bourton-on-the-Water with is tranquil river, the Windrush, which meanders through. Where the river enters the village centre, over the rapids next to the Old Mill, its clear waters flow under a miscellany of arched stone bridges past the green with its banks of Cotswold stone. 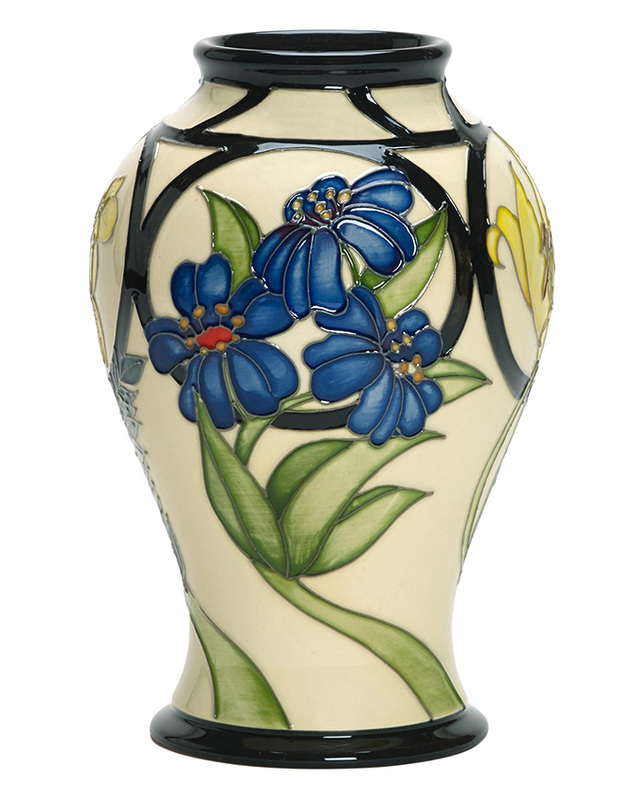 Moorcroft designer, Kerry, has been inspired by this beauty spot in years gone by. This time she returns to offer a vision of the banks of Windrush where nesting mallards gather. The leaves of antique trees ebb between deep summer green and the golden sand which echoes the stone bridges. Bourton-on-the-Water is exclusive to The Cotswold Shop, as a limited edition of 50 priced at £315. 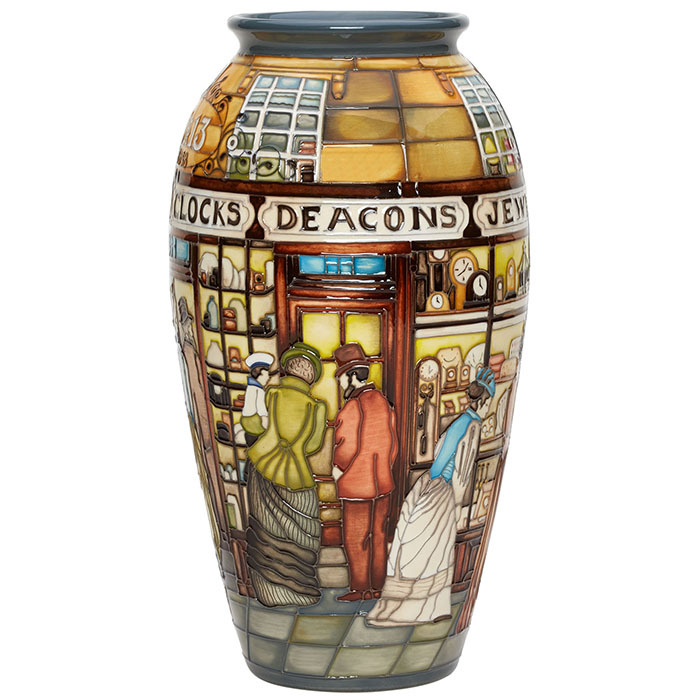 In the world of Moorcroft, the name of Treeby and Bolton has become almost synonymous with the panoramic splendour of the Lakes and the town of Keswick in which it lives. This is no ordinary shop. Treeby and Bolton is almost a work of art in its own right, offering fine work to all who walk through its door whilst all around Keswick lies some of the most spectacular scenery that England has to offer. Friars Crag is one of the jewels in the Lake District, situated on a peaceful promontory jutting into Derwentwater with views across the lake to Brandlehow Woods, the first property ever to be acquired by The National Trust in the Lake District. 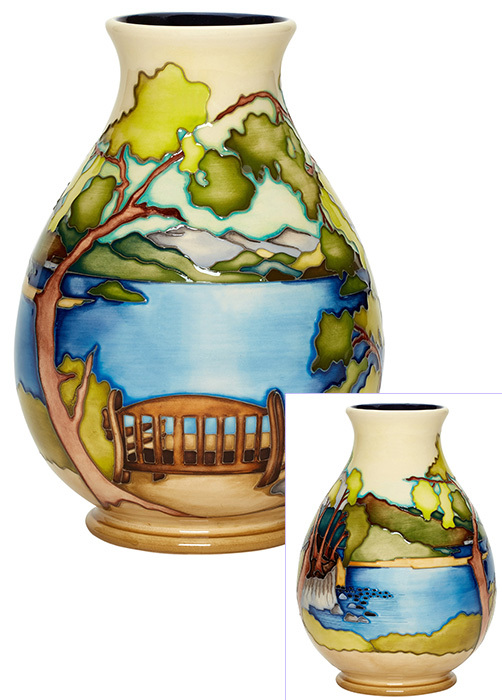 It was inevitable that a Moorcroft designer should seek inspiration from the beauty of Friars Crag, in much the same way that Treeby and Bolton should seek to secure Friars Crag as a limited edition of 50 pieces all of their own. Treeby and Bolton will be hosting a launch event on Saturday 16th June from 12 – 3pm with designer Kerry Goodwin and Antique expert Eric Knowles in attendance. Come along and join both of them for an enjoyable jewel of a day in the Lakes. It was in 1848 that a clever, ambitious and entrepreneurial young man, George Deacon, founded a watch, clock and jewellery business in Swindon. In those early days, it was not easy to source diamonds and other precious stones, gold, silver and rare metals which are central to a fine jeweller’s business. The opening of the Great Western Railway between Paddington and Swansea from the early 1880s to 1893 would have featured very much in George’s thinking, and it was that instinctive commercial inspiration which set him apart from most of the new retailers who appeared at the same time across the country and yet who seldom made it to a second let alone third generation. In the early 1890’s, the Deacon family, and George’s cousin Hubert in particular, were heavily involved in the design of the civic structure of Swindon. Projects included new town gardens, landscaped across an ancient quarry, rounded off with a fine, iron Victorian bandstand. Built in the late 19th century, it was made by Elmbank Foundry, Glasgow, out of cast iron with an aluminium sheet and lead roof. Octagonal in shape and raised on a podium with four steps, it included, perhaps not surprisingly, a square clock tower with a ball finial. Today, the bandstand is not only a Grade II listed building at the heart of Swindon gardens, but also the theme of a special design from Kerry Goodwin called simply Swindon Bandstand. 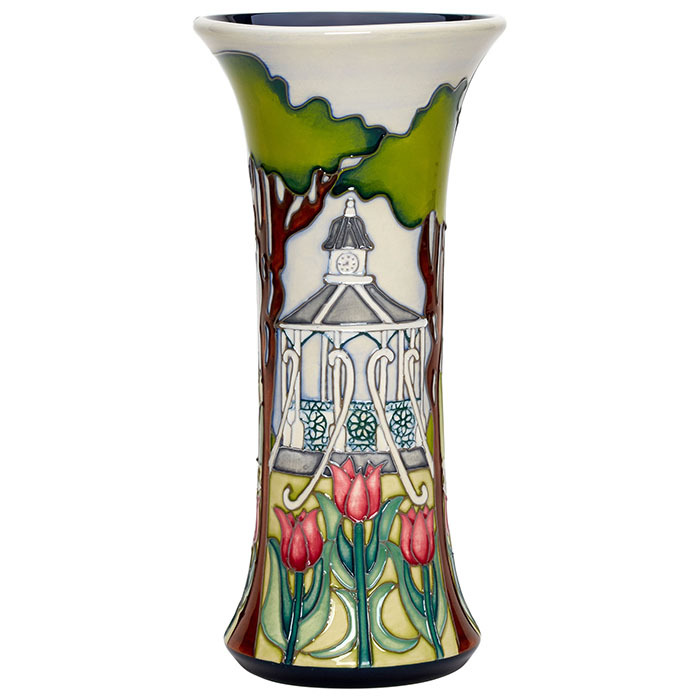 To keep the spectacular, Swindon Bandstand limited edition of 20 company, Moorcroft has taken the unusual step of presenting a second design, also featuring the famous Swindon Bandstand. Designer, Emma Bossons FRSA, offers Bandstand Gardens, to become the second bandstand design, as a limited edition of 25 pieces. Emma tempts the Moorcroft connoisseur with a stylized image, in which the bandstand is actually the pot itself and from inside the building the gardens, complete with familiar Moorcroft trees dating back to the early years of the last century, enrich the landscape of the gardens. The iron top of the bandstand is actually the shoulder of the classic 72/6 vase itself, neatly divided into sections and capped off on the rim with a Deacons’ clock! 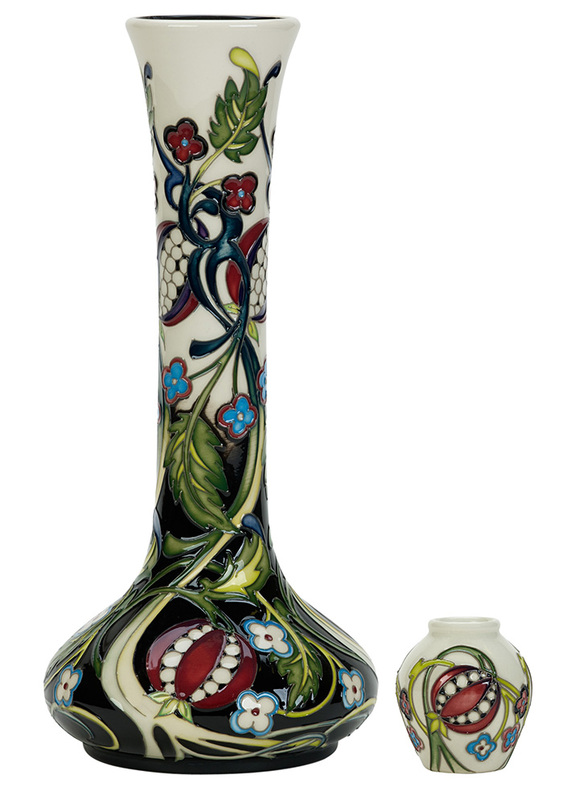 In contrast, Moorcroft artist and designer, Paul Hilditch, has stepped in with The Deacons Legend, on the 393/10 shape as a limited edition of 15. This is an historical look at Deacons actual shop premises in Swindon and celebrated Moorcroft retailers for almost 20 years. Goviers of Sidmouth has been a retailer of fine china and giftware since 1904, specialising in commemorative designs. This year, to celebrate the wedding of Prince Harry and Meghan Markle, Goviers called on Emma Bossons to create a design exclusive to them. Goviers themselves put forward the concept of ‘Royal Dolphins’ to represent the couple and Emma certainly delivered. Under the Laws of the United Kingdom, dolphins are Royal fish, and when taken become the personal property of the reigning monarch as part of the Royal Prerogative. Mixed with several other ancient and unusual rules, the Royal Prerogative embraces some of the lesser-known powers of the British Monarchy. Originally derived from a statute from 1324, at the time of the reign of King Edward II, it is still part of our Statute Law today. 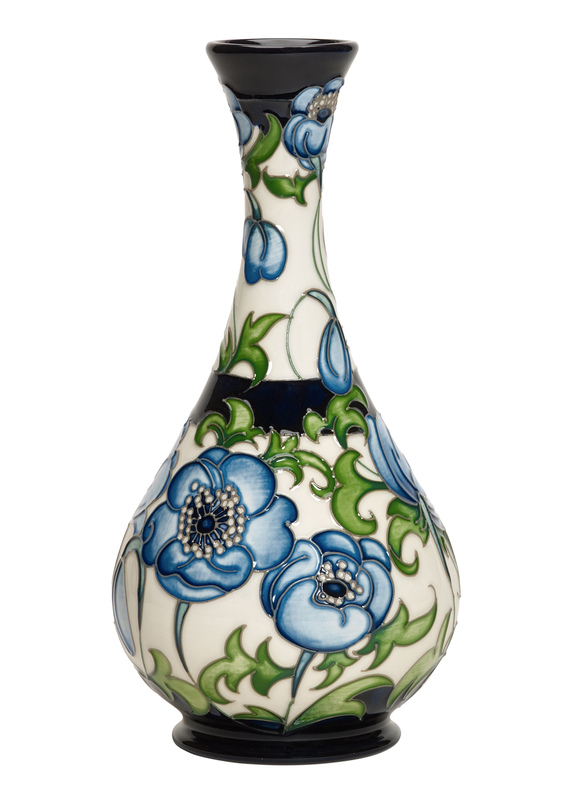 Emma’s design commemorates this special time for the royal family through a classic Moorcroft design, with a nod to regal history, in iconic colours of royal blue and white, wishing Prince Harry and Meghan Markle a lifetime of happiness in light of their forthcoming marriage. 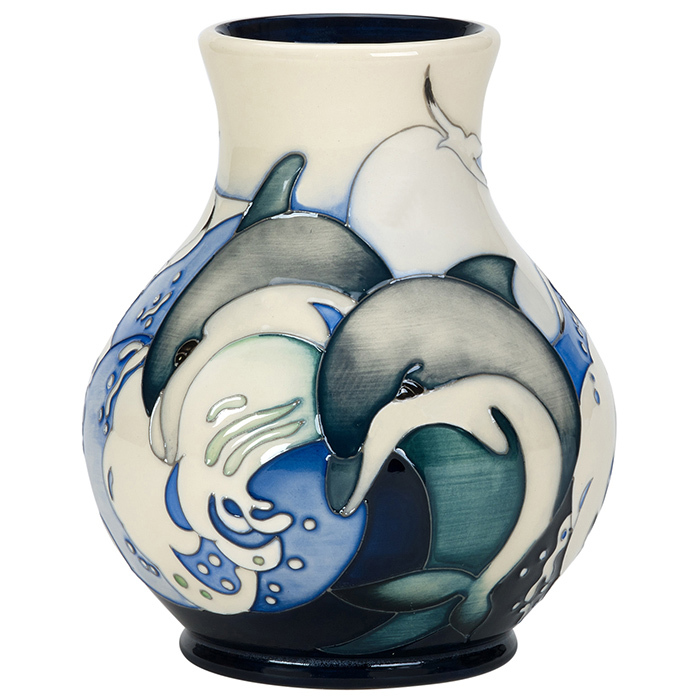 The Royal Dolphins is a Limited Edition of 75 pieces, available exclusively from Goviers of Sidmouth, RRP £375. When Vicky Lovatt visited Christchurch, New Zealand in 2014, she was overcome. A city devastated by natural disaster had begun to regrow like saplings after a forest fire. Within the shells of former buildings, and from the debris of fallen bricks, new life was emerging. The city was transitional. After the earthquakes of 2010 and 2011, Christchurch coped through creativity. With the Re Start container mall, the Cardboard Cathedral and some of the many pop up restaurants, contemporary art galleries and shops- the ‘Garden City’ spoke to Vicky and she was instantly enamoured. Her design tribute to Christchurch features ChristChurch Cathedral, the cathedral seat of the Bishop of Christchurch. Repeated earthquakes damaged the building (mostly the spire) in the course of its history but the 2011 earthquake destroyed the spire and part of the tower, and severely damaged the structure of the remaining building. The remainder of the tower was demolished in March 2012. In Vicky’s design the stunning Gothic revival architecture is entwined with Korus. Koru, the Maori word for ‘loop’, refers to new shoots of the silver fern. Perfect for Vicky’s design, the Korus display a circular movement towards an inner coil, and in this they represent ‘going back to the beginning’. The unfurling frond itself is symbolic for new life, new beginnings, hope, perfection, rebirth, a new start, nurturing, a new phase (in life), the spirit of rejuvenation, and peace. 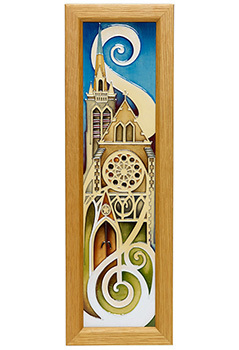 Moorcroft are donating one of these entirely handmade plaques to the Cathedral to sit with the congregation. 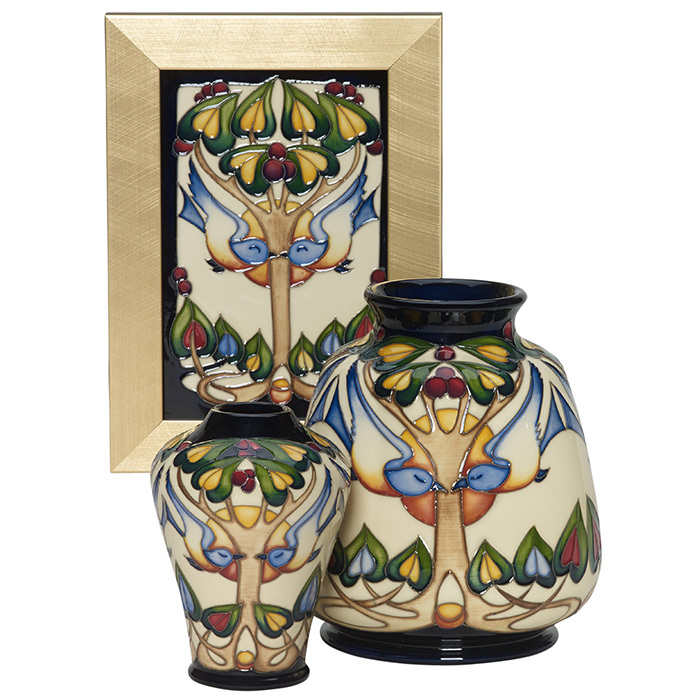 Moorcroft sincerely believe that it is people that matter, and would not like the plaque to sit in a vault or box. If we can raise a smile with this artwork as our clay cathedral soars up into the heavens we have played our part. 2017 is a special year for Canadians as it brings with it the 150th anniversary of their Confederation. This is a celebration of the official recognition of the initial Confederation, which was an early version of what was to become Canada, as we know it today. Queen Elizabeth II, Canada's sovereign, offered her best wishes and congratulations on the 150th anniversary of Confederation in December 2016 whilst Prince Charles, and his wife, the Duchess of Cornwall, are set to tour Ontario and Nunavut before attending the national celebration in Ottawa in July. 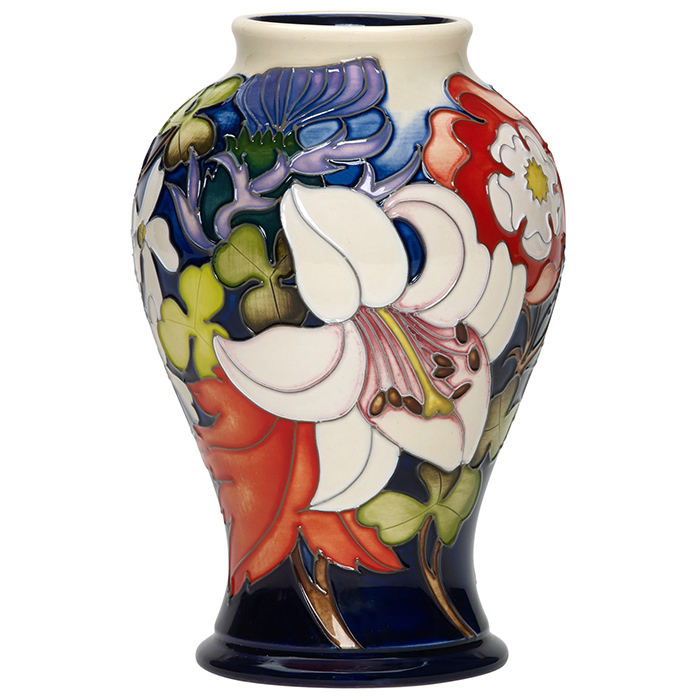 As ever, Moorcroft speaks in flowers and through the medium of ceramic art. To pay tribute to this special anniversary, Emma found meaning through the floral emblems which are found on the heraldic device of the Canadian Coat of Arms. Her design therefore is a bouquet of beauty, filled with significance, with Tudor Roses, shamrocks, thistles, Fleur de Lis and maple leaves. All the flowers tie wonderfully together, in the same way that Canada’s diverse ancestral heritage does too. Confederation is designed by Emma Bossons FRSA on the 65/6 shape as a limited edition of 25 pieces, RRP $673 CAD, exclusively available from Moorcroft retailers in Canada. 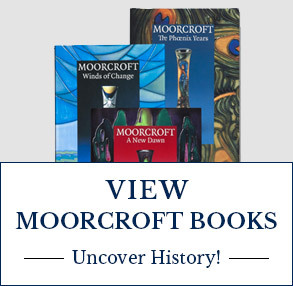 The relationship between two original Arts and Crafts forerunners, Moorcroft and Liberty & Co, has been entwined for decades, much like the threads running through an oriental tapestry in the London store’s wonderful carpet department. It was Sir Arthur Lasenby Liberty who founded the world-famous fabric, decorative furnishing and ornament Emporium, Liberty & Co., and who went on to become a stockholder of W. Moorcroft Ltd back in 1913. 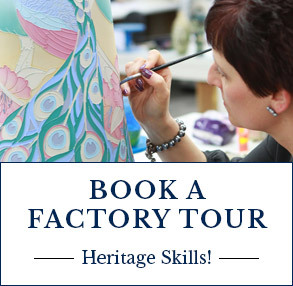 Much has happened since, and the story has been told through many Moorcroft designs as that familiar Grade-II-Listed Liberty & Co. building will always remain a great source of inspiration to Moorcroft designers. Nicola Slaney, was invited to create an exclusive vase for Liberty & Co. for 2017. With its Tudor-revival frontage and beautiful wood-carved interior, the building inspired Nicola who immediately took pen to paper. Drawing upon the intricate blossom and pomegranate detail of the wood-carved staircase, Nicola wrapped the luscious fruits, with inviting seeds, around an elegant Edwardian-style vase. Scattered with delicate four-leaved flowers and tendrils of foliage, Ascension plays testimony to an Aladdin’s cave of treasures, riches, artworks and creations which visitors enjoy every time they ascend to the lofty heights of the Decorative Arts department on Liberty’s third floor. A complementary miniature vase is offered with every 99/11 vase. These pieces are only available from Liberty & Co in London, RRP £640. Nestled in a medieval deer-park, Knole is vast, complex and full of hidden treasures. Originally an Archbishop’s palace, the house passed through royal hands to the Sackville family - inhabitants from 1603 to today. The ancient structure feels almost weighed down by its own history - six centuries of it. Visitors are impressed by the enormous size and completeness of Knole, but those who really connect with this special place love its quiet dignity and its almost melancholy feel. The grandeur has passed but its old, glinting beauty remains. Vicky Lovatt pays regular visits to Knole when she visits her family in Kent. Vicky’s designs, The Sackville Leopards, The Wildflower Window and The Knole Guardians Plaque and Vase all visit elements of the unusual architecture and sheer beauty of the surrounding grounds. Charles Voysey (1857-1941), an adventurous designer of decorative arts who embraced the notion of actually bringing the garden into the house, seeing birds and trees, favoured motifs, as symbols of an ‘unspoilt nature’. In 1899 Voysey created one of his most famous designs, ‘Tree and Swallows’ for a woollen textile to be manufactured by A. Morton & Co. and more than likely to be sold by Liberty & Co. The woven cloth shows the influence of William Morris's principles of pattern design and use of plant forms and animals as standard motifs. In a very similar way, Rachel’s designs are dominated by flowing patterns incorporating birds, deer, hearts, flowers and trees in silhouette. 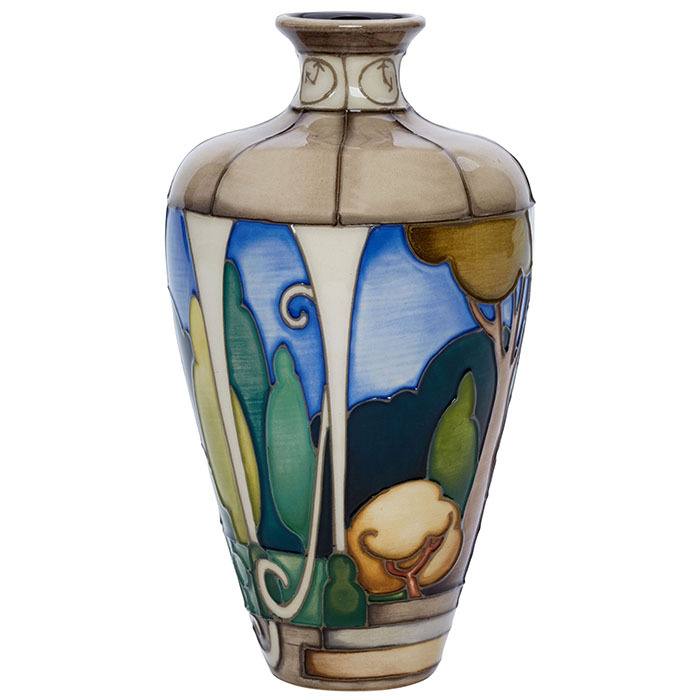 Rachel manipulated Voysey’s patterns of yesteryear into immaculate ceramic artworks for modern homes. The Orchard is a quaint testament to this talent and is also the namesake of the home which Voysey built for himself and his wife at Chorleywood in Hertfordshire. The Orchard, on the 576/4 (4" in height, RRP £265), 198/5 (12.5" in height, RRP £380) and PLQ5 (13cm x 18cm, RRP £150) shapes, is available exclusively from Liberty. 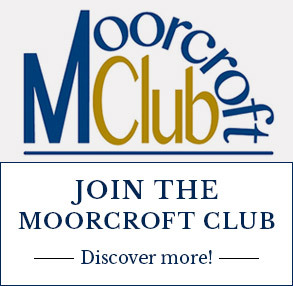 Almost 120 years have now passed since a fresh-faced and ambitious young man named William Moorcroft was offered a job as a designer by the industrial china and earthenware manufacturers, James Macintyre & Company of the Washington Works, Burslem. His work would impact the world of ceramic art. His designs still inspire people a hundred years later. His influence still resonates throughout the humble red bricks on Sandbach Road in Burslem, a short walk from the place where his career first began. William’s vases from the Moorcroft Museum and photographs in the numerous Moorcroft books, still beckon the current Moorcroft Design Studio. Senior Designer, Rachel Bishop, is more than acquainted with the Florian style William strived to perfect in those early years. In this design, Florian Revisited, created especially for the William Sissons Gallery in Yorkshire, Rachel recalled one of her favourite Florian designs, decorated with blue poppies. There can be no doubt that the design is distantly related to its ancient ancestors, but of course Rachel has reworked the design in her own, inimitable way. Florian Revisited takes the almost translucent petals of this enigmatic flower to glorious heights, back-dropped by strands of cobalt blue and crisp ivory clay. 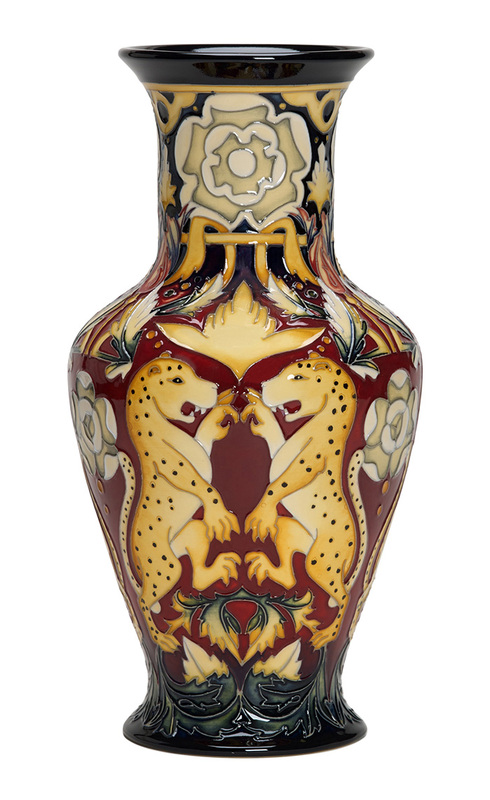 It pays homage to the past but is a brilliant portrayal of the colour, clarity and precision employed by every single artist and craftsperson at Moorcroft today. The Sissons Gallery can now offer Florian Revisited as a 80/9 vase (RRP £395) along with two stunning new lamps on shapes L46/10 and L65/6 (RRP £495 and £405 respectively). Situated in the picturesque market town of Keswick in the heart of the English Lake District, Moorcroft retailer, Treeby and Bolton has been a very special china shop for over 100 years. In this time, the store has expanded and now also houses a fabulous selection of contemporary art and glass, unique bronzes and design-led interiors across the three floors of its beautiful building. 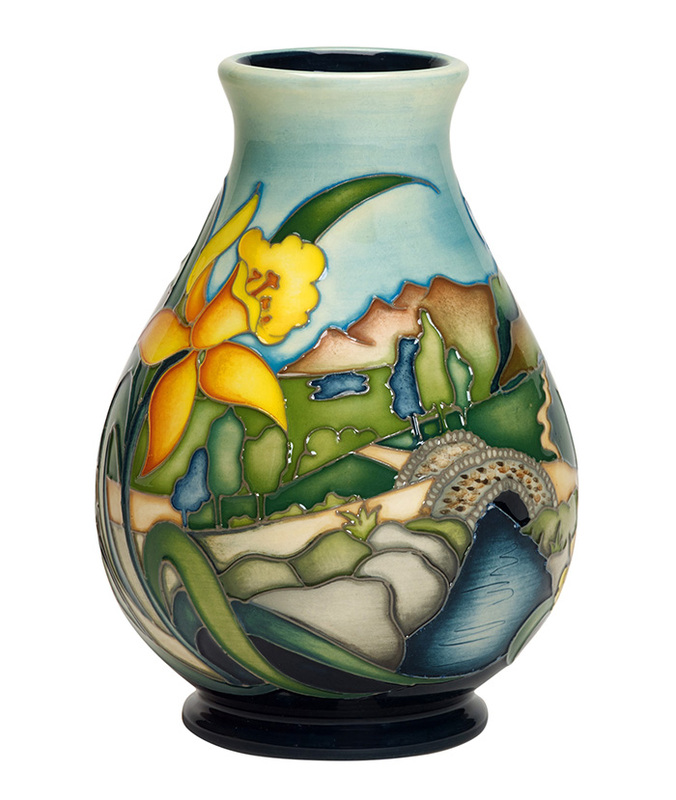 With a varied and up-to-date selection of Moorcroft, the shop is an unavoidable destination for any collector visiting the Lake District. Ashness Bridge is perhaps the most photographed packhorse bridge in the Lake District. From this traditional stone-built bridge, visitors can enjoy breathtaking scenes of Derwentwater with Bassenthwaite Lake behind and Skiddaw rising above the town of Keswick. With the majestic Lakeland peaks in the background, Nicola focuses on this special viewpoint through clusters of ancient trees and stones worn down and smooth from the thousands of people whom have stood admiring the views before them. Ashness Bridge sits central to the design with each stone painted individually and the cool flow of Barrow Beck running underneath. Of course, an Ode to the Lake District would not be complete without a daffodil, and so vibrant yellow petals leap from the foreground as if heralding the next person to cross Ashness Bridge. Designed by Nicola Slaney, Ashness Bridge on the 7/5 shape, is a numbered edition featuring a special ‘Treeby and Bolton’ backstamp. RRP £395.